A few weeks ago, I went to MoMath, an incredible new museum in Manhattan where the beauty, complexity, and joyful nature of math is visible and available for thirsty and voracious learners to explore. 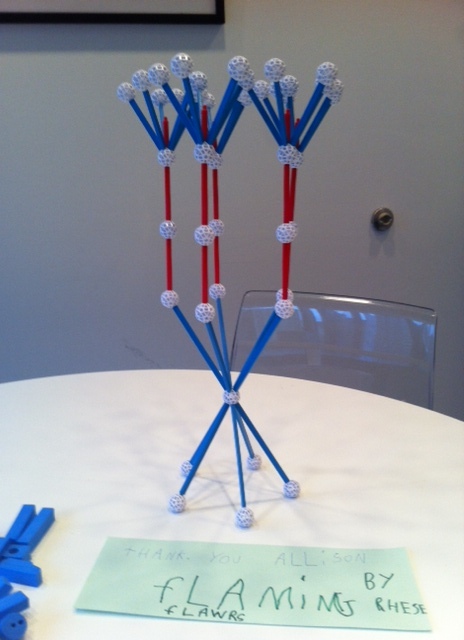 I gravitated towards their Zometools, building tools that allow children to build all types of geometric constructions. I rushed to purchase many boxes of these tools (among other fantastic games) for Blue School. I delivered them to classrooms on Monday. On Thursday, a child came to me with the sculpture he made from the tools, and a card on which he labeled the sculpture, "Flaming Flowers." He told me I could "borrow" the sculpture for a few days – his way of saying thank you for purchasing the tools for his classroom. It sits on my table now, on loan until Monday. We examined it and spoke about his process, and then we turned it upside down, and we saw his flowers become a rocket ship. Later on in the day, I walked upstairs, where kindergarten children created a structure by balancing sticks on top of one another. They had created a perfectly balanced cluster of about 15 sticks on top of just one or two. I asked them what they were building and each child joyfully shared a different description. I challenged them to keep going to see how high they could build their structure. One child said, "But what if it falls down?" and the other responded, "Well then, we will try again." What does this have to do with saving science? Dr. Anissa Ramirez, Ph.D., engineer, who spoke with co-founder Matt Goldman at SXSWedu last week, credits her inquiry training in the sciences with giving her the ability to "stare at an unknown and not run away, [because this] melding of uncertainty and curiosity is where innovation and creativity occur." By giving children the space and time to explore a variety of materials, we encourage them to question, take on new perspectives, work together, conjecture, and support their thinking with evidence. At Blue, children are given time to observe and reflect, to compare, connect, and extend their ideas. They learn how to assess what worked and what didn't, and how to try again. Across the subject areas we explore at Blue, we emphasize the tools children need to be active learners and partners in their education rather than passive recipients of content. As the E.O Wilson offered in his advice to young scientists at TEDMED, "What is crucial is not technical ability, but imagination in all of its applications." So, when you hear someone speak of creativity in opposition to (or even just next to) science, remind them how Ramirez and E.O. Wilson, and all of our most cherished scientists and engineers, use their creativity. Tell them about the courageous, imaginative, disciplined, project-based work that scientists do in pursuit of the big ideas they create that make the world better. Then, tell them Blue stories about balancing acts in kindergarten and the flaming flowers/ rocket ship in first grade, and more, about ways our children are thinking about pop up playgrounds for areas impacted by natural disasters, methods to solve a math problem, or ways to preserve the history of our Seaport. Creativity is not just for the arts and it is not an add-on to the Blue curriculum. Creativity is essential to everything we do, including as Ramirez says so well, to saving science. Posted on March 8, 2013 by Allison Pell and filed under Uncategorized.